The Philips Sonicare DiamondClean Smart is a high-end series of electric toothbrushes. 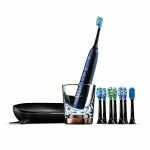 It is the most advanced products released in mid of 2017, Philips called it “the world’s most intelligent toothbrush”. It comes in 3 different packages, the 9300, 9500 and 9700(9750). Philips describes this series as “Sonicare’s best and most complete care for a healthy mouth,” so it’s easy to see where they’re aiming at here: right at the top end of the market. The differences between the 3 models are fairly simple to explain. The 9300 (HX9903/11) is the basic model of the DimondClean Smart series. It offers 4 cleaning modes: Clean, White, Deep Clean+, and Gum Health. It comes with 4 brush heads and a choice of 4 colors: white, black, pink or Grey. The 9500 (HX9924/41) is an advanced model, it offers all that and one extra cleaning mode, called Tongue Care, along with one extra brush head for tongue cleaning, and finally, it also provides 4 colors. The 9700 (HX9957/51) and 9750 (HX9954/56) is the top model of the DimondClean Smart series. It offers 4 brush heads in total and comes only in a color called “lunar blue”, which must be to mark it out as the flagship model. Both the 9500 and 9700/9750 come with a handy USB charging case, which is great for when you are traveling. You could be sitting in an airport with your toothbrush hidden inside its discrete case and plugged into your laptop, happily charging up without any chance of making you look odd. We have reviewed the Philips Sonicare DiamondClean and provided the crosswise comparison with Oral-B Pro 7000 months ago. At the time, we said that the lack of APP was a great pity for Philips’ fans. Subsequently, Oral-B launched the Genius Pro 8000 Series, to further strengthen its advantages in the intelligent APP. However, Philips is aware of the attractiveness of the brushing APP and its versatile sensing technology to potential users, they are trying to catch up – starting from release the Dimondclean Smart series. All the Philips DiamondClean Smart series models deliver 31,000 brush strokes per minute and incorporate the company’s Sonic technology. This uses sweeping motions to drive fluid between your teeth and along the gum line, which effectively flushes out bacteria from all the hiding places where they love to settle down and multiply. The result is that DiamondClean Smart brushes remove 10 times more plaque than a conventional toothbrush, and in Gum Health your gum health should improve by a claimed factor 7 times more than a manual toothbrush in 2 weeks. I’m not sure how they measure that, but the results are noticeable. You experience better oral health, better overall health, and cleaner, brighter teeth. In Whitening mode, it removes twice as many stains in just 3 days as a manual toothbrush can, and with every mode, you can choose from 3 different intensity levels, so you’ll always be able to brush comfortably. A great feature of all 3 brushes is what called “smart” brush heads. Clever technology on the handle tracks your usage time and how hard you’ve been pressing, so it knows when to light up an icon on the handle that tells you when to replace your brush head. Smart sensors also take the guesswork out of brushing for you. They can monitor the location of the brush, so they know exactly where you’ve brushed already and which bits you’ve missed. They can also sense if you start scrubbing your teeth, which is not a good thing to do. The scrubbing sensor will remind you to let the brush do all the work for you. All of this information is delivered to you via the Phillips smartphone APP. This is a free download that works with iOS or Android phones and acts as a brushing coach to help keep your technique in line. The APP is so precise that it can tell if you missed any teeth while brushing. With a feature called TouchUp, it will show you where you missed a spot and send you back there for a second pass. Another feature of the APP is a 3-D mouth map. If your dentist has highlighted any trouble areas you can see them and be reminded by your phone screen to pay them extra attention. It also offers features called Smart Mode Pairing and Brush Head Recognition. This means you never have to wonder about which mode and intensity you should be using, as it takes care of this for you. The brush head has a microchip inside which identifies itself to your DiamondClean Smart handle. If you’re as bleary-eyed as me first thing in the morning then you’ll welcome any feature like this that reduces the amount of thinking that you have to do. With the TongueCare+ mode on the 9500 and 9700/9750, you will be guided to remove the bacteria that cause mouth odours from the pores of your tongue. The matching brush has 240 micro bristles to clean bacteria and food debris. I can’t tell if this is better than using a regular toothbrush or not, but it certainly feels nice to use and Philips has obviously put a lot of thought into it, so it can’t hurt to include such a feature. 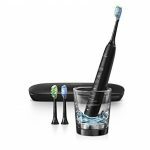 The 3 models also have a pressure sensor that can tell you if you are brushing with too much pressure. A light ring on the end of the handle flashes when it thinks that you should ease off. Add to all this useful timing feature will that tell you how long to brush for and you have quite a comprehensive approach to keeping your mouth healthy. The first time you plug in your Philips DiamondClean Smart series electric toothbrush you’ll need to leave it for at least 24 hours to ensure that it gets a full charge. This may seem like a long time to wait but you get a good 2 weeks of use in return for your patience. When it does start to run low, a battery indicator will flash with an amber color to warn you that you only have 12 more uses remaining. This is a handy feature that means your brush should never run flat on you. Clean: whole mouth cleaning mode, lasts for two minutes. White: removes surface stains while polishing and brightening front teeth to make them whiter. Polish: polishes teeth to reveal the natural gloss. Gum Care: gently stimulates and massages gums to promote nourishing blood flow. Sensitive: the extra-gentle mode that goes easy on gums and sensitive teeth. The charging glass is a nice idea. Many toothbrushes offer chargers that look dull and functional, but Phillips give you a rinsing glass which the brush handle stands in and charges up from, all thanks to conduction technology. It’s a “two birds with one stone” kind of an idea and a very welcome one that helps it looks right at home in any modern bathroom. The 9500 and 9700/9750 also provide you a decent looking travel case with a USB charging port. It is a very considerate design if you are a frequent business travel person. The crystal brush heads holder is provided only in model 9570. It is nice looking and very useful for storage 4 replaceable brush heads (including a tongue brush) in all together at your bathroom countertop, but personally, it’s not a necessary accessory for everyone if you don’t have to share your brush handle with your family. The most abundant APP on the market, especially with the sensor on the brush handle, perfectly matched! A choice of up to 5 brushing modes and 3 intensity levels give you plenty of options. The low battery warning helps you avoid running flat, by warning you to charge up when you only have 12 brushes left. The USB travel case and glass charger are novel and attractive. High-end features will cost you a high-end price. All 3 models cost a lot of money, as do the replacement smart brush heads. The charging case could do with more room to hold extra brush heads. Other Phillips brushes have 3 weeks of battery life. These have 2 weeks, which is probably down to the fact that they have so many features drawing on the power. There’s no doubt that the Philips DiamondClean Smart series electric toothbrushes are feature-rich models that offer a premium cleaning experience. 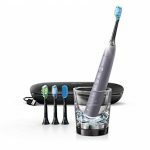 All 3 are well-designed with a modern attractive look, have decent if not outstanding battery life and all take the guesswork out of brushing your teeth highly effectively. They are very good at what they do, giving you a clean that feels as though you just came straight from the hygienist. The only downside is the high price. You may wonder, do you really need to spend so much on a toothbrush? Well, perhaps and perhaps not. The guided brushing features might actually save you money in the long run. If you adhere to the advice of the APP then you’re much more likely to retain the kind of great oral hygiene that will cost you less when you visit the dentist. When you compare this range to Phillips’s own DiamondClean, the one without the “Smart” tag, they look to be good value. It’s close to being the same brush, with the same levels of cleaning quality but without the integrated smartphone APP and smart brush technology. However, in the same price bracket as the 9300 and 9500, so those two models, in particular, look much more attractive as a result. Good article/comparison. But I do not understand the ‘glass charger.’ Is the glass simply a place to stand the toothbrush or does it actually do something? The “glass charging system” of DiamondClean series (including Smart) has consisted of 2 parts – a wireless charging base (Model HX9000/02) and a glass cup (Model HX9000/01). You are right, the glass cup is just a place to stand your brush handle and the real charging device is the wireless base under the glass. It should be noted that because the charging base has a special shape, only the Sonicare glass cup can fit it. Is the idea then to leave it charging in the cup all of the time? I usually let my older model drain completely before charging it..
You did the right thing if your older model is using the Ni-MH battery which has the memory effect, Recharge after completely used up or have a complete charge and discharge circle in every 3 months can extend the battery life. However, the DiamondClean series is equipped with the lithium battery, it can be charged at any time and will not reduce the battery life. I suggest you charge it in the glass cup every 2-3 days. Nice review. Have the original white DiamondClean, but was considering getting a DiamondClean Smart as the metal tip (inserts into toothbrush head) on my DiamondClean is getting loose :/ – unit is out of warranty (have used it for like 5 years now) and I like it. Not really sure if the “smart features” and premium for the smart “heads” is worth it – I am more than happy to use OraBrush for my “tongue brush.” Think I’m going to go with the 9500 as I don’t really care about the color (9700 exclusive) and will probably only stick to one brush “head” so the extra brushes included with the 9700 are useless. Black Friday/Cyber Week deals drop the price of the 9700 below $150. My family member like different brush heads, so the extras won’t go to waste. However, I can see someone knocking over the glass cup. Travel cases are more practical for us and our shared bathroom spaces. Thanks for your sharing. Indeed, the charging glass is easy to break and its non-antiskid, but some customers find it very novel to charge in a glass cup.